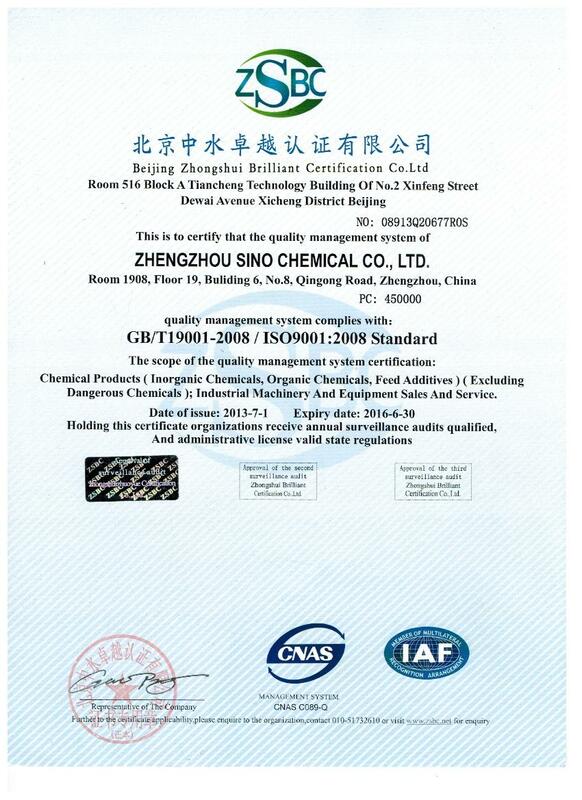 Company Overview - Zhengzhou Sino Chemical Co., Ltd.
7YRSZhengzhou Sino Chemical Co., Ltd.
Zhengzhou Sino Chemical Co., Ltd. Located at Henan Province,Zhengzhou City and covering an area of 10,000M2,Sino Chemical is a company with an integrated system of researching, development,production, marketing and sales ability. It mainly produces water treatment, painting & Coating chemicals. Our products are widely applied to Industrial and municipal water treatment, construction, paint, oil drilling, food and feed. With ISO9001 quality management system, all our products are manufactured by strict procedures. With the advanced test equipments in our Lab, all shipments are tested carefully before delivery to assure the quality consistency. The quality standard for each customer is established. All the sample and shipment lots have been filed detailed and be able to traced. Through many years of development, our company has become a large-scale enterprise with research, production, assembly and marketing capabilities. Guaranteeing stable and timely supply, credible quality and sincere service, our products sell well in both domestic and overseas markets.Our aim is to provide customers the high quality products, most competitive pricing, the shortest delivery time and the unequaled service. We pursue the management tenet of "Quality is Superior, Service is Supreme, Reputation is First", and will sincerely create and share success with all clients.We welcome you to contact us for more information and look forward to working with you!